The city of Torrance, California lies a little northeast of Long Beach, in the southern part of Los Angeles County. It has a bustling population of nearly 150,000, and is a primarily coastal city since much of it lies only a few miles from the Pacific Ocean. 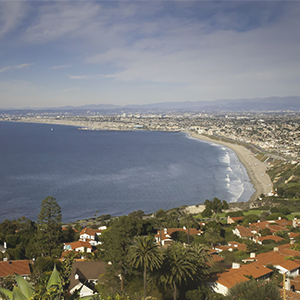 Torrance has 1.5 miles of beautiful beaches, which are often more secluded as they are lesser-known than the nearby beaches of Santa Monica, Redondo Beach and Manhattan Beach. Torrance, like much of Southern California, was originally inhabited by Native Americans, and later by Spanish settlers in the 1700s. A land grant for Rancho San Pedro, which includes land on which the present-day town sits, was issued in 1784. The city was incorporated as a U.S. city in May of 1921. A wide variety of hotels and attractions entertain visitors of Torrance every year, many of which are a part of the city’s nonprofit visitors’ bureau. The city’s Spanish influence and heritage still run strong here, and visitors can explore the Torrance Cultural Arts Center, the Torrance Historical Society, the Dominguez Rancho Adobe Museum and many other cultural attractions. For those who prefer a more adventurous outing, the TCL Chinese Theater in Hollywood, Knott’s Berry Farm and the Disneyland Parks are all just a short drive away. Attorney Brian A. Newman has been representing clients and defending the rights of Torrance citizens for almost 40 years. He strongly believes every single person is entitled to their legally protected rights and is deserving of a fair and just experience with the justice system. If you are facing criminal charges, business law matters, or a personal injury, Brian A. Newman is the experienced lawyer you need. Contact the Law Office of Brian A. Newman today at (424) 275-4014 to schedule a free consultation with a trusted, compassionate attorney.